2 Bedroom villa for sale in a small villa complex. Views over the rice fields and mountains. Management and a rental license are available. A villa for residential of commercial living. These 250 sqm 2 x 1,5 bedroom duplex villas are fully furnished and sit on 300 sqm of leasehold land, located in a village just 5 minutes south of Central Ubud. Traditional antique 4 bedroom villa for sale, just about 3 kilometers from Ubud center. A wooden construction, all built in a large garden. Very attractive wooden house for sale on a short distance from Ubud. This property is often rented out to families with kids who are attending the Greenschool. Forget Alila, The Hanging Gardens and all the other beautiful resorts in and around Ubud. This is by far the best. Guess what, it is also for sale. This is a basic cozy home for sale with views over the neighboring rice fields. A simple house with 2 bedrooms and even a swimming pool. Waking up in this villa, overlooking the forest in front of you, hearing the sound of the running river below the villa. This is a dream which can be yours. This old gallery is for sale in Lodtunduh. It needs renovations but ones done, you can have a new gallery, or maybe you want to change it into an hostel or yoga retreat. The house offers you an experience to stay in an environmentally friendly and ecologically sustainable compound, which is a part of Balinese village life. This house is just about 5 minutes walking away from the Greenschool. 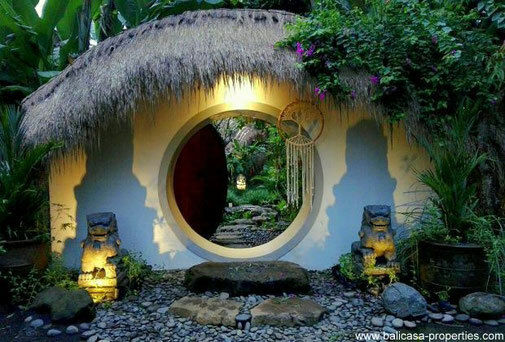 A property with a very tropical garden and an open building where you can practice yoga. This large villa is surrounded by rice paddies. This is the real Bali what you find here. 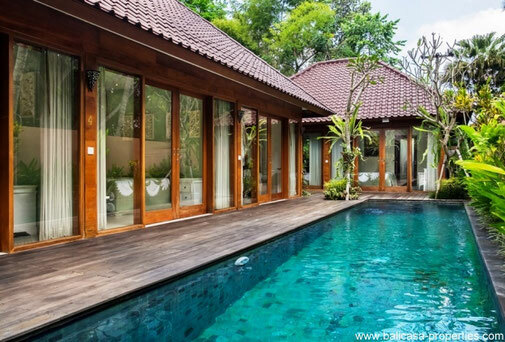 This modern 2 bedroom villa is a combination between modern architecture and Balinese heritage styles. The large windows allow views in all directions. 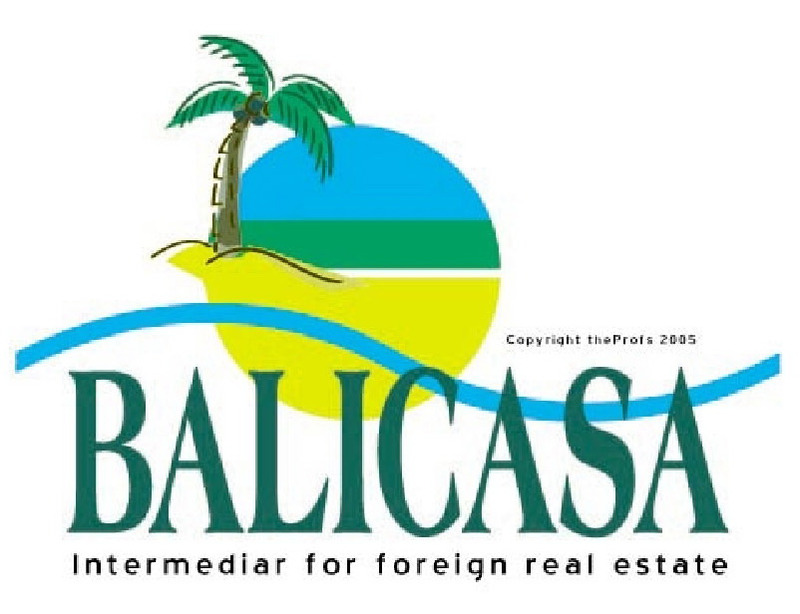 Is it your dream to live in Bali and start a business? With this small scale guesthouse you can fulfill your dream. Located on a 15 minutes walking distance from Ubud center. A wild flower garden, organic garden, this all is surrounding this Baturiti mountain villa. 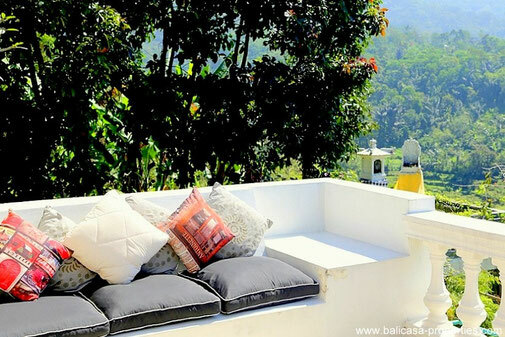 Ideal for a small private yoga retreat or simply a place to relax and enjoy the panorama. An unique Balinese Ubud resort with true character on offer for sale at the outskirts of Ubud surrounded by rice fields only. This resort on a rural and quiet location is a top business opportunity. This bungalow resort in Gianyar is for sale in a very rural area. Are you looking for a place with shops and restaurants nearby, simply skip this listing as this is not interested for you.